What is the sound of one heart breaking? A Hank Williams song, of course, though not the one you may be thinking of. That slightly modified Zen Koan came to mind after a Fais Do-Do (Cajun Zydeco dance party) at the Golden Sails Hotel PCH Club (their bar) in Long Beach last Sunday. I don’t usually frequent such places (just approaching my 3rd year of sobriety in a well-known twelve-step program) but Jill invited me, so I went. Two non-alcoholic mineral waters got me through the evening, and as I listened to the music and watched the couples dancing I fell in love. The six-man band was great—even though this was only their second public performance in this configuration; the clear leader was Paul Rathje on accordion and vocals, who has been playing out of the limelight for fifteen years before finally going public with his finely tuned Cajun sensibility pouring out of all the reeds in his instrument; Ben Guzman on fiddle; Doug Davis on acoustic guitar; Gene Williams on bass guitar; George Bernardo keeping a steady beat in several different time-signatures on drums; and the only Louisiana Bayou born and raised member, the colorful Dempsey Pappion on rubboard, triangle and whooping, shouting vocals. The totally committed woman who produced the show and went around the room making sure we were all enjoying it was Karen Redding—head of Louisiana Dance LA. 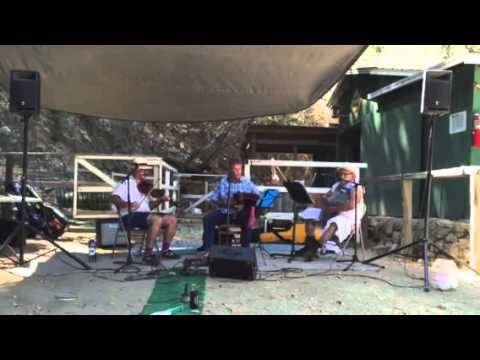 Here is Karen’s own description of the band and the sources of their music: Accordionist Paul Rathje and fiddle player Ben Guzman, along with rubboard player and vocalist Dempsey Pappion bring southwest Louisiana to California even as they bring to life the authentic, "old style" Cajun French lyrics of the songs of 20th Century Acadiana. Join Paul, Ben, Dempsey and the band as they play the waltzes and two-steps you would have heard at church dances and house parties when life was lived the old-fashioned way. Rathje's passion began almost 20 years ago when he started attending local Zydeco dances and heard the Cajun accordion played for the first time. A classically trained pianist, Rathje picked up a single-row and began to learn to play. His interest grew into an obsession with Cajun music which in turn manifested in countless trips across the country to take lessons from the best Cajun accordion players in the genre. Thousands of hours of practice later, Rathje has come out of hiding and into the light where he is a very welcome surprise! Everything I know about Cajun culture I learned from old master storyteller Justin Wilson (April 24, 1914 - September 5, 2001), I gawr-on-tee! I have a dozen of his comic Cajun story albums, recorded live in front of appreciative highly-entertained audiences throughout the South. Wilson also hosted a Cajun cooking show “Outdoor Cooking With Inside Help” on PBS for many years, and sprinkled in his rollicking humorous stories like they were part of the recipe for excellent jambalaya, crawfish pie and filet gumbo. I was one of his faithful listeners, both for the recipes and the stories—which he told in southwest Louisiana patois just like he heard them growing up. Justin Wilson taught me that “Cajun” is a dialect version of “Acadian,” which was the original name for the French Canadians (thus, “Acadian,” from Canada) who settled in Southern Louisiana as a part of the great 19th Century migration from the MacKenzie-Papineau Rebellion of 1837 that brought many exiles (who weren’t hanged in Canada) to the United States. In New York they became part of the Champlain Valley, whose songs—including the best known Un Canadien Errant—were documented by Pete Seeger in his 1960 Folkways album, Champlain Valley Songs. But they didn’t all stop in New York, just because it was the first safe haven. The truly intrepid ones—who wanted to get as far away from Canada as possible—kept wending their way south until they reached the Mississippi River, and followed it all the way to the Louisiana Bayous. They called themselves “Acadians” and that eventually morphed into “Cajuns.” Independent, free spirits their music was similarly unique and homemade, a country music within country music that has thrived to this day, both at home and in devoted outposts like Southern California. That is why this “Authentic old-style Cajun Music” can now be found in sympathetic venues like the Golden Sails Hotel PCH Club in Long Beach. All but one of the songs were sung in the original French, which underscored the exotic nature of the entire musical experience. As outstanding as the band was, though, to really savor the flavor of this music you need to hear and see it next to a dance floor with an audience of willing participants. This is dance music of a very high order, but dance music it is. So the band came equipped with a dance teacher—Sandy Baker, who has been teaching these steps for 15 years—and who spent the first half hour from 4:00 to 4:30pm instructing us in the finer points of Cajun dance—swinging our partners to the beat of a different drum—some waltzes and some two-steps. She slowly built a repertoire of different steps that could then be combined in any number of synthetic dance moves, which you have to see and mimic to really appreciate. Some of them were reminiscent of my earliest memories of 1950s sock hop dancing, with Buddy Holly, Ricky Nelson and Elvis on the radio. But some of them were unique to Cajun rhythms, particularly in the way your feet would do what they call “the Cajun shuffle.” Even I, who does not pretend to be a dancer, was inspired by the joie de vivre of their music. During the Cajun dance lesson, the band was not involved—Sandy used very effectively a series of CDs on their portable player. After a 15 minute break the band took the stage and rocked the house with authentic Cajun tunes from backwoods, small towns and parishes and Louisiana house parties and church dances. It was a head-spinning, mind-bending tour through a warmhearted passionate culture that we only saw a warped glimpse of during the national reporting of Hurricane Katrina’s tragic aftermath. To see and hear it in full throttle was a revelation—of music that speaks directly to the heart and soul—a life affirming uplifting “joyful noise” just like the Bible described great music. The Lord Himself would have been well pleased to hear it. As one of their songs so memorably says: “Laissez les bons temps rouler!" My eyes were drawn to two couples on the dance floor right in front of the stage in particular who made the evening quite special. I overcame my natural shyness and approached both of them to get acquainted. The first were the best dancers on the floor—Juan Lopez and Felicia Savchenko. Juan was a tall distinguished-looking gentleman who teaches Argentine tango—with a graceful mustache and casual fedora that suggested a strangely compelling portrait of Ernest Hemingway in his middle years—before the beard became a fixture. And Felicia was a slender black-haired “stone cold fox” according to Jill, dressed all in black—an elegant international folk dancer who Juan held tenderly and swirled around to every finely-nuanced dance move the band could conjure up. They were a joy to watch; it was clear they had been dancing together for many years. When I noticed two tall cocktails on their table I got curious: “What are they?” I asked. “Oh, cranberry juice,” they quickly replied. “We couldn’t do this if they were anything stronger.” What a delightful answer I thought; quickly putting a stop to the unwarranted fantasies of rum and Coca Cola drinks I assumed were more in keeping with the Hemingway persona I had constructed and projected onto them. The only thing high at their table was my own imagination. They were very kind to let themselves be interviewed even briefly and give me permission to include them in this story. It was clear they had no ambition to be publicized in this way. Their presence brought out the very best in other dancers inspired by watching them—and the musicians as well. The synergy between the stage and the dance floor was palpable throughout the evening. Just as remarkable and riveting to watch for an entirely different reason was the second couple I became curious enough to talk to—Eric and Shirley. They were the couple that broke my heart. He was the bass player for another band—The Zydeco Mudbags, led by Dave Souza—which had played at the same venue a couple of weeks before. His name was Eric Ward and he was black; her name was Shirley Pappion and she was white and elderly. She was also in a wheel chair, which was why I noticed her on the dance floor, as Eric was pushing her chair across it. I just assumed he was pushing her for purely utilitarian reasons, to get her across the floor to the other side. I saw she was moving her feet—at first I thought just to help him—and thought no more of it. Son of a gun gonna have big fun on the Bayou! “Zydeco has a heavier beat,” he said, “a stronger bottom.” As the electric bass player for the Zydeco Mudbags, he would be in a position to know. I tried to talk to Shirley when she started to say something, but it was hard to understand her, and I could see the bond between them that enabled them to communicate—sometimes with just a gesture. It was so moving to meet them in this totally unexpected setting—a connection back to my own family that gave me a new appreciation and deeper understanding for the power of music and dance to come into our lives and give us nonverbal ways to express our love—love that nourishes and sustains us through even the hardest times and a fatal illness—just as I had to communicate with my own mother at the end. With thanks to Jill Fenimore for inviting and treating me. See Golden Sails Hotel PCH Club meetup for future Zydeco dances. Other CD Reviews, festivals and dance listings can be viewed by searching for CAJUN in the search bar (magnifying glass) on the top of the page. Friday November 20 at 8:00pm Ross commemorates the Centennial of the execution of Labor’s greatest troubadour Joe Hill at Beyond Baroque Literary Arts Center, 681 Venice Blvd, Venice, CA 90291 310-822-3006 ; $10. Sunday evening December 20 at 7:00pm Ross Altman and a Small Circle of Friends celebrate Phil Ochs 75th birthday with a concert of his songs at Beyond Baroque Literary Arts Center, 681 Venice Blvd, Venice, CA 90291 310-822-3006 ; $10.